Deb, who took charge of Tripura last month, has made several remarks which have been triggered widespread criticism. 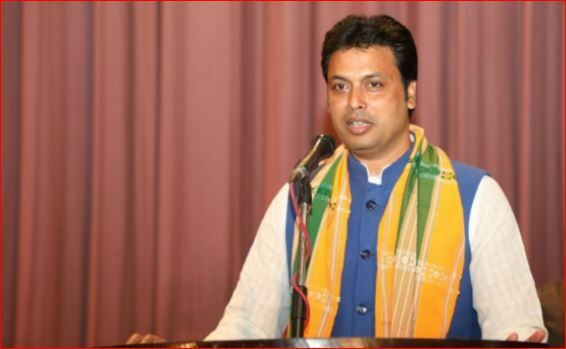 Prime Minister Narendra Modi has reportedly summoned Tripura Chief Minister Biplab Deb who has issued a string of controversial remarks recently putting the party in a tight spot. A senior BJP leader on Sunday said Deb has been summoned to meet PM Modi and party president Amit Shah on May 2 in the New Delhi. "Senior party leaders are miffed over the controversies triggered by Deb's statements. Deb is just saying anything and everything. Modi will talk to him," IANS quoted a senior party leader, as saying. Speaking at an event in Agartala on Saturday (April 28), Deb suggested the educated youth of his state to consider opening a paan shop or breed cows rather than running behind government jobs. "The Europeans and the Americans may claim that it is their invention, but it is actually our technology. Internet and satellite system had existed during the lakhs of years ago. How could Dhritarashtra see through Sanjay's eyes? There was technology available at that time... Internet was there, satellite communication was there," Deb had said.